Given the skill of spammers and scammers in manipulating search engines, don’t be so quick to click on that first link in search results. Several clients have recently clicked on what appeared to be the first search result for “microsoft tech support” or “dell tech support” and ended up at what can most charitably be described as unofficial technical support services. Desperate, they call the number on the unofficial tech support web site, thinking they’ve reached the official tech support site of the manufacturer or developer. They’re then pitched an expensive solution that includes allowing remote access to their computer. A couple of clients, believing they were talking to official Microsoft or Dell support technicians, have allowed access to their computers with less than desirable results. I Googled “microsoft tech support” this morning and the official Microsoft tech support site at http://support.microsoft.com was the fourth link (see screen shot), while two other sites above it looked official but were actually ads for microsoft.myphonesupport.com and microsoft.mytechhelp.com/support. 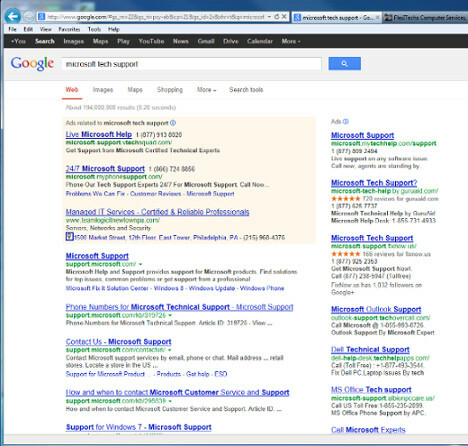 I got similar results for “official microsoft tech support” and for “dell tech support“. Typically, the first few Google search results are ads rather than results from Google’s search engine. The ads at the top of the results allow the unofficial sites to appear higher than they would in the regular results and take advantage of our inclincation to click on the first link. I’ve also noticed that on some LCD screens, and depending on the angle of the screen, the colored background that delineates the ads from the regular results sometimes washes out to white and creates even more confusion. A good way to tell if you’re clicking on an official site is if that organization’s name appears just before the .com in the URL. For instance, for Microsoft tech support, you should see “microsoft.com” in the URL, as in the above http://support.microsoft.com. Similarly, Dell tech support is at http://support.dell.com and http://www.dell.com/support. Note the difference between that and the unofficial URLs above like “microsoft.mytechhelp.com”, where “microsoft” is part of the URL but not directly followed by the .com part.